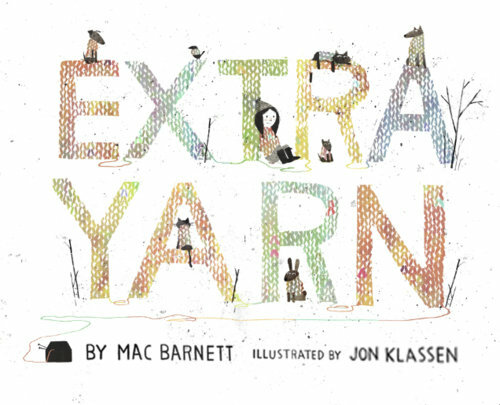 Extra Yarn by Mac Barnett. 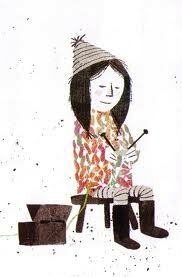 Illustrated by Jon Klassen. Balzer + Bray, 2012. Currently available. Face Value: To die for. Jon Klassen’s illustrations throughout the book are worthy of framing, but the cover is especially dynamic. I love the knitted texture of the title lettering. Does it break the slate? Yes, it does. It’s not a slate smashing kind of picture book in the way that Imogene’s Last Stand is, but it definitely challenges our ideas of what children can be capable of. Annabelle’s knitting is quietly rebellious rather than in-your-face, and that’s part of what makes her such an appealing character. She is understated in her Slatebreaking. Who would we give it to? Resourceful, creative little ones who love to make things. They will connect with Annabelle and her creative use of the endless yarn. Review: Mac Barnett is hot stuff in the world of children’s literature. He partners with other hip authors and illustrators (like Adam Rex) to pump out a stream of picture books and novels featuring a brand of humor that kids love. Kirkus Reviews recently called one of his books “wonderfully ridiculous,” which is a really great phrase that I think can be reasonably applied to the rest of Barnett’s body of work. Jon Klassen has also been making a splash in kidlit with his weirdly hilarious book I Want My Hat Back and his illustrations for The Incorrigible Children of Ashton Place series. When these two goofy guys got together to create Extra Yarn, magic happened. Annabelle is a little girl who lives in a very dreary town. Nothing is bright or cheery – there is only “the white of snow or the black of soot from chimneys.” So it’s understandable that Annabelle is intrigued when she discovers a box filled with yarn in every color of the rainbow. Being the type of girl who doesn’t wait around to take action, she immediately heads home and knits herself a sweater. There’s some leftover yarn, so Annabelle makes a sweater for her dog too. Still the box is full of yarn. But it turned out she could. And she did. Even for Mr. Norman. And when she was done, Annabelle still had extra yarn. This is the brilliant moment when the story turns from innocent to revolutionary. At first Annabelle was just knitting sweaters, making the world around her a bit more colorful. Now she’s using sweaters to challenge adults and change the status quo. And of course, kids love picture books in which child characters prove adult characters to be wrong. Take that, grumpy Mr. Norman! Annabelle’s knitting soon becomes prolific. She’s putting sweaters on everyone in the village (except for Mr. Crabtree, who hates sweaters, so Annabelle makes him a hat instead). Then she begins yarn bombing the buildings all over town. (Don’t know what yarn bombing is? It’s a public creative display of textile art – check out some cool examples here.) The town becomes much more colorful and Annabelle achieves celebrity status. Then comes the villain. (There’s always a villain!) An archduke who is a bit of a clotheshorse sails across the sea to visit Annabelle and demands that she sell her box of yarn. He offers millions of dollars, and even bargains with her a little, but Annabelle isn’t interested in selling. She loves knitting and its making people happy, so why would she sell it? What is she going to do with millions of dollars? Annabelle’s nonchalant refusal of the money is so refreshing, so down-to-earth, that my admiration for her as a character grew ten times reading that one little page. Peeved that the little girl won’t sell her yarn, the archduke sends robbers to steal it. Of course, because he is the villain and has bad intentions and because Annabelle is awesome, it all works out in Annabelle’s favor. Take that, archduke! Annabelle manages to be happy with her yarn and her needles and her faithful dog because she is bringing some color into a bleak world. That’s good enough for her, and it was certainly enough to make this book a delightful reading experience for me. Barnett and Klassen have created a book with immense charm and a subtle message about the importance of creativity and ingenuity in children’s lives. It’s definitely a winner and would be a great read-aloud with both boys and girls. Reviewed from a copy that Sarah gave me as a graduation gift. Thanks Sarah! You’re the best at picking out books! This entry was posted in Picture Books, Reviews and tagged creativity, jon klassen, knitting, mac barnett, picture book, yarn. Bookmark the permalink. I was introduced to this book over the weekend, and I loved it. I am glad you are giving it more exposure!